Class 7 had a fantastic day today! It was the last day of Art Month, so everyone made pirate hats and swords out of newspaper during morning Discovery Time. 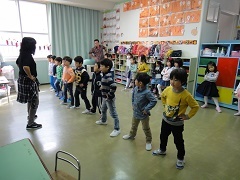 After a quick Morning Meeting, we were able to practice one of our dances for Hyougen Festival. Today was only the second time the children had done it, but already they have learned so much. After a yummy lunch we got straight to our English Play. 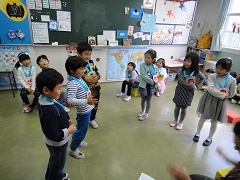 All the children of Class 7 are enthusiastic about their characters and their songs, and are already able to remember many of their lines and lyrics. 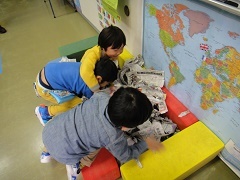 Finally, we played a great game where their children went digging for the sweet potatoes they had made. It was a great end to the week. We can’t wait to see everyone in their Halloween costumes on Monday!